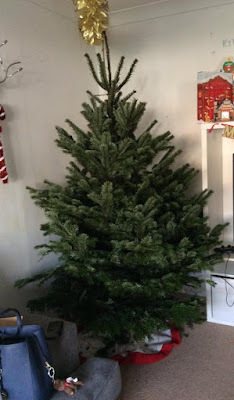 Mum of Five Staying Sane: Our Nordmann Fir real Christmas tree from Pines and Needles. Why not visit one of their many locations across the London area or buy online for delivery to your door. 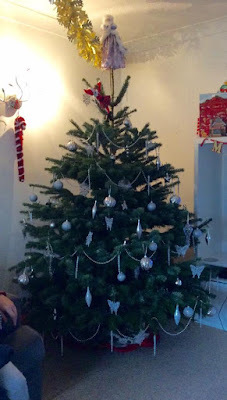 Our Nordmann Fir real Christmas tree from Pines and Needles. Why not visit one of their many locations across the London area or buy online for delivery to your door. Last week our Christmas tree was delivered from Pines and Needles. A completely different Christmas tree experience compared to years gone by. Pines and Needles have really opened our eyes to the ease of buying a tree and the quality that can be provided even though we didn't choose the tree ourselves. They have many sites across London where you can go and choose your own tree, something we always have done in previous years. We would spend ages at our local garden centre picking up hundreds of trees to inspect the height, how tall and bushy it was. Was it even on all sides with a good balance of branches all the way up the tree. It would take ages and although it was always a fun family tradition there were times when it all got too much and you thought you would never find the perfect tree. Our Pines and Needles tree as it arrived and after decoration. Along came Pines and Needles. Last week the most perfectly proportioned six foot Nordmann Fir arrived on our doorstep. It was delivered at midday day on the specified date netted and wrapped for transportation. I unwrapped it and got it in the stand straight away and it looked great as soon as it was out of the packaging. We can't fault the tree that has been delivered. I let it stand until the evening to allow it to fall into place nicely. We found the best spot in the living room for it and I decorated it myself. I've not overdone it with the decorations this year. I've kept it simple yet (hopefully) elegant with keeping to just silver decorations. The process was so easy, either visiting one of their London locations to choose your own or ordering online if you can't visit. They have a choice of Nordmann Fir or the more traditional Norway Spruce and also lots of heights to choose from too, Having the tree delivered was rally great and although the OH was a bit worried that his tree choosing had been taken out of his hands he was really, really impressed with the tree that arrived from Pines and Needles. 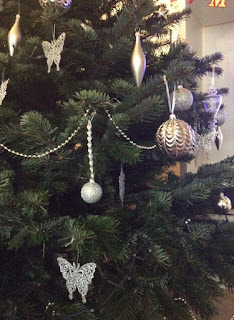 A close up of the branches and our decorations. They even offer a whole decorated tree package where you can choose the tree, then the stand, the lights, a decoration pack catered to the size of tree and then it all delivered straight to your door. Also, if you are in the London area you can also have their personal decorators to come to your home or office and do all of the tree decorating for you. The choices from Pines and Needles are fab. 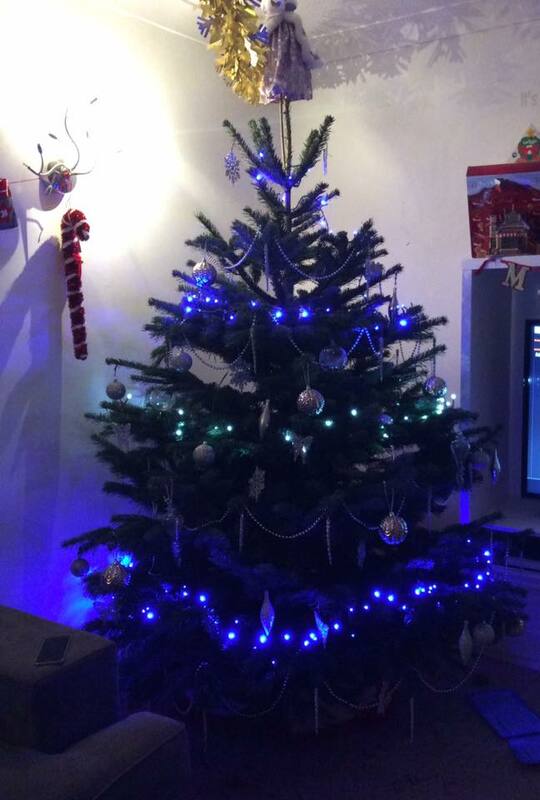 So as the festive season gets well under way and everyone gets their Christmas trees in place and decorated we would definitely very highly recommend Pines and Needles for your real Christmas tree this year. Prices start from £31.95 for a Norway Spruce and £35.95 for a Nordmann Fir. Trees come in 3 foot to 9 foot then 10-12 foot options with large trees (12 foot and above) available upon request. Delivery is available on trees up to 9 feet for Nationwide delivery with various different delivery options available and starting at £14.95. 10-12 foot trees are only available for delivery within their London catchment area. Disclaimer; Our tree was gifted to us by Pines and Needles for the purposes of review, all thoughts and views are our own.